Gaikai seems to have leaked the price for renting games through PlayStation Now. VG247 has eagle-eyed a UI concept from the official website for the online rental service, and the rental prices, written in light blue, will be as low as $4.99. 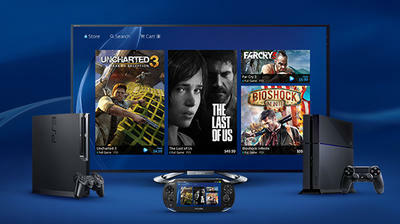 Sony has prices varying from game to game. Uncharted 3, a first-party game published by Sony, will be available for the lower price at $4.99, most likely because Sony doesn’t have to pay a licensing fee and wants its own games to rank higher on the popularity lists. On the other hand, a third-party title like Ubisoft’s Far Cry 3 will be available for a dollar on top at $5.99. Full games will also be purchasable through the network with The Last of Us going for $49.99, and it is described as the “Full Game.” Sony did not comment on VG247‘s questions regarding the pricing, so it remains unknown how long these games will remain in your possession for that price. Of course, this image could be bogus. Consider it a nice point for speculation, though. Seems like a solid deal, especially for games you never plan on playing again after you beat them. It makes me wonder how much this will affect Sony’s latest winning streak with generous sales. Some games, like Ni no Kuni: Wrath of the White Witch, drop to sales prices of $6.99 during special events, and that is for a full download. Will Sony be keeping that trend alive?